Detangling our natural hair is something we all have to come to grips with every time we plan on cleansing our hair, or creating a new hairstyle. Depending on how you approach it, it can either be a painless and dare I say quick experience, or it can leave you with a brush full or broken hair and dashed dreams of reaching your hair length goals. Since detangling is key to removing shed hair and retaining length, here are my top tips for detangling your mane. I find it so much easier to detangle my hair when it’s in a stretched state, such as an old braid-out, twist-out or even a bun. It makes it possible for any tangles and matted sections to separate easier than when it’s in its original curl. I divide my hair into 4 sections, and work on 1 section at a time, while I keep the other sections twisted or pinned up. Trying to work on all your hair at once can lead to one tangled up situation and before you know it, you’ll have more tangles than what you started out with. You know that saying “divide and conquer”? Well it’s never been more fitting than for this scenario. For the sake of manageability, I never detangle on dry hair. I simply take my spray bottle and mist my hair with a bit of water to make my hair more malleable, which decreases the chances of breakage. Work your favourite oil into your hair as you detangle. This will provide slip to your hair that will make detangling easier and help to slip hair strands out of any knots you may have. It will also help to slide your detangling tools through your hair. If you prefer your hair to be quite wet during detangling, apply your conditioner that provides the most slip. Often a combination of oil and conditioner create a dream platform for quick detangling. 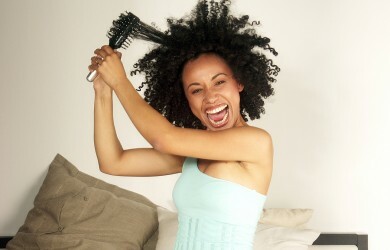 If your hair is very fine or prone to breakage I would definitely consider tossing the brushes and combs in the bin. Although it’s more time consuming, finger detangling has worked wonders for me by allowing me to retain my length. At the most I’ll use a wide-tooth comb, and that’s only occasionally. When you use your fingers, you can actually feel the knots and tangles, as opposed to using brushes and combs, which can lead to tugging and pulling and eventually breakage. I detangle by holding a section of my hair in my hands, pushing my thumbs through the strands, and gently pulling the tangles apart all the way to the ends. If you use a comb or brush, I recommend starting from the bottom and working your way up. If you have a knot that you can’t undo no matter the amount of water, oil and conditioner you’ve added, cut it out with a pair of hair scissors. I always hate having to do this, but rather a little snip than risk even more of the surrounding strands becoming entwined in the knot. Also, resist the urge to just pull the hair out. I do a major detangling session as part of my pre-poo before I cleanse my hair, so I’m killing two birds with one stone. It usually takes me half an hour. Even though my hair was shorter a year ago, it actually took me much longer to detangle back then as I was still trying to figure out the best way to go about it. Since then I have managed to cut down on my detangling time by incorporating these techniques and keeping my hair detangled throughout the week, so by the time wash day rolls around it’s not such a dramatic affair. I’ll end by saying that whether it takes you 15 minutes or 3 hours to detangle, patience has to be your middle name. If you try and hurry the process, your hair is going to end up everywhere except on your head. Rather leave it for a bit and come back to it later when you have more time. Stunning, thanks for this link Bantse. When are you headed back to SA? End of April, I was only in India for a few months but I think I like my hair transitioning time. Brilliant post. I totally agree with finger combing. I remember when I first went natural, that was all I did. Now, I use both finger combing and traditional brushing/combing. The key is to be selective with which type of brush you use- I find that makes a huge difference. Hey Victoria, thanks for the positivity. It’s true, a comb does still have its place, it’s just about finding the right balance between finger detangling and combing.